Homewood City Hall is located at 2850 19th Street South, Homewood, AL 35209; phone: 205-332-6100. Photo: Samford University Campus, Homewood, Jefferson County, Alabama, photographed by sweetmoose6, 2006, en.wikipedia.org, accessed March, 2011. Homewood is a city of neighborhoods — a so-called "first ring suburb" of Birmingham, the state's largest city. It is a city of places — and of historic place names — a city that was formed from three small municipalities. It is a city of multiple identities, in which the residents are passionate about where they live and about the interrelationships they have with the place. Those multiple identities form much of the city's quality of life. Homewood's major commercial, industrial and institutional activity centers are located mostly toward the edges, rather than the middle, of the city. These include such diverse places as Brookwood and Lakeshore Hospitals, Wildwood, North Wildwood and Brookwood Village shopping centers, and Samford University along the south edge, a significant concentration of office, industrial and warehouse uses to the west, and commercial corridors to the east and west, in the form of US Highway 31 and Green Springs Avenue, respectively. 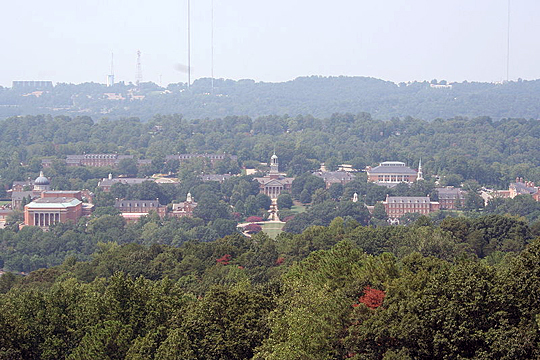 Identity of the city as a whole is strongly related to identity with the city's three or four oldest neighborhoods, plus the area known as West Homewood. The symbolic heart of the city as a whole is Downtown Homewood. But, tucked away in or near the heart of each of its major identifiable places are the essentials of the city: small, internal nodes of daily and weekly activity, such as parks, neighborhood commercial centers and elementary schools. Most of these elements exist and operate on a truly neighborhood scale. In contrast, regional commerce, higher education, major employment, health care, and traffic maintain a separate coexistence, mostly apart from the daily lives of most of the city's residents. To miss this aspect of Homewood is to miss the essential character of the city entirely. The character of these predominantly residential areas of the city is critical to its quality of life, and the character of each is intimately associated with the nonresidential activities, land uses and functions located at the edges — or, in some cases, at the centers — of their daily lives. The most beloved of these incorporated functions operate at a neighborhood scale — or, in the case of Downtown Homewood, at the scale of the community, which is the collection of the city's neighborhoods and identifiable places. Downtown may be the symbolic heart of Homewood, but neighborhood centers — those existing and those that have been lost over time — are the symbolic hearts of the city's four largest neighborhoods: Edgewood, Hollywood, Rosedale and West Homewood. Homewood Planning Commission, Homewood, Alabama Master Plan, 2007, www.homewoodal.net, accessed March, 2011.